The international reader The Secret of Forgiveness of Sin and Being Born Again is published over a million copies and is translated into 24 languages. With its first publication in 1988, The Secret of Forgiveness of Sin and Being Born Again is Pastor Ock Soo Park’s all-time bestseller – over a million copies published – that has led many to the assurance of salvation. It is translated into 24 major languages, including English, Spanish, Chinese, Japanese, German, Russian, Tagalog, etc. The book also serves as a testimonial of the gospel that guides modern world to Christianity. In December 2009, the Department of Justice distributed 100 copies to each prison in South Korea, providing prisoners the access to the book as well. 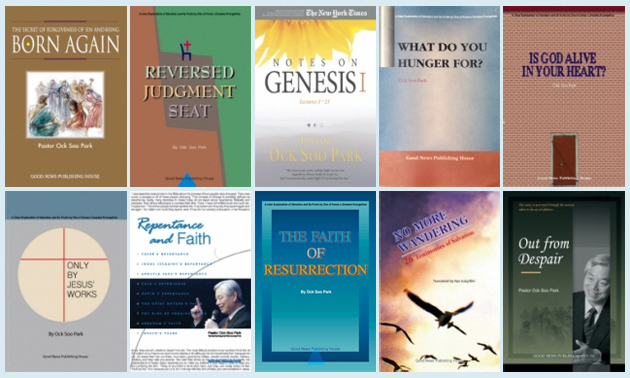 In addition to The Forgiveness of Sin and Being Born Again, Pastor Ock Soo Park has written 38 books, and every publication has been used as a vehicle for the gospel that brings rest and joy to many hearts. Also, the Good News Magazine is published monthly to deliver the gospel of salvation and testimonies of grace (vol. 317: Aug. 2012) in English, Chinese, Japanese, and Spanish. The Good News Newspaper publishes 120,000 copies every week, and the American edition is published in Los Angeles, U.S.A. Moreover, Pastor Park’s primary sermons have been printed in The New York Times and The Los Angeles Times – the world’s largest daily newspapers – biweekly for two years.